Click here to print this worksheet. For more of our free Cinco de Mayo worksheets and activities, click here. 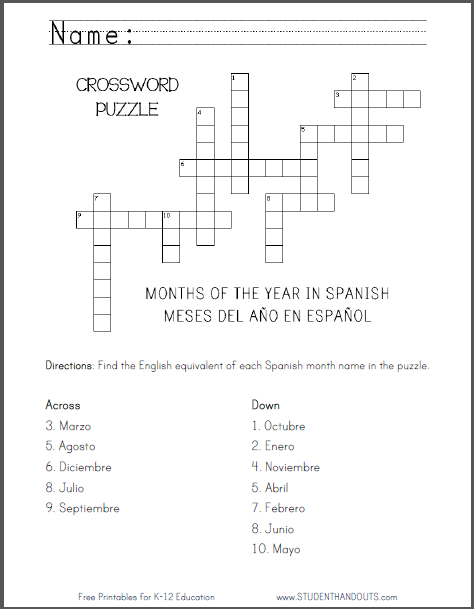 Directions: Find the English equivalent of each Spanish month name in the puzzle. Across: 3. Marzo; 5. Agosto; 6. Diciembre; 8. Julio; 9. Septiembre. Down: 1. Octubre; 2. Enero; 4. Noviembre; 5. Abril; 7. Febrero; 8. Junio; 10. Mayo.